It all started so well for Queens tonight as the re-arranged game against Dundee United - originally abandoned at half-time back in December- started, and finished, but from a Queens point of view on reflection if the chance to call it off again at half-time had been offered, it would surely have been accepted as a promising display in the first half was washed away as Dundee United turned the game around and thoroughly deserved their win. Following the win at Dumbarton, Queens made one change to the team that started that game with John Rankin coming in for Derek Lyle, and the formation was changed as we went with a 4-4-1-1 set up. 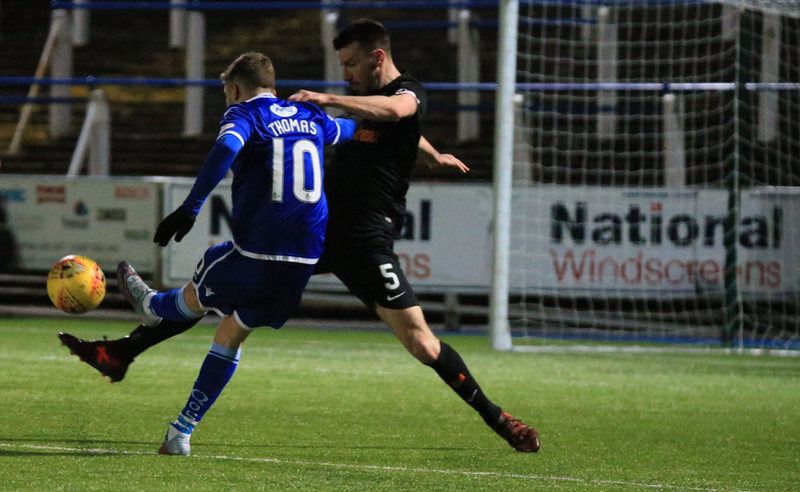 The opening exchanges saw both teams looking to attack and Dom Thomas looked to be the main threat for Queens as early on he combined well with Stephen Dobbie only for Dobbie`s effort to slip wide of the far post, and the same pair linked up again minutes later, but again Dobbie was unable to trouble United `keeper, Lewis. As Queens continued to push forward an attempted shot from Dobbie was blocked and sat up nicely for Rankin to strike, but he was unable to keep his shot on target. On 14 minutes Dundee United created a fairly decent chance when Durnan`s long ball found Mikkelsen but his half volley was easily saved by Jack Leighfield. The first yellow card of the game was shown to Murdoch for a foul on Rankin, and with Queens well on top at this stage, a flowing move ended with a cross from Jordan Marshall being headed over by Joe Thomson. The opening goal followed just a few minutes later, and what a stunning goal it was. After gaining possession on the right Dom Thomas attacked at pace and just short of the penalty area cut inside and curled a superb left footed shot past `keeper Lewis. A second goal at that stage would have given Queens a distinct advantage, but sadly when the next goal did arrive - just 3 minutes later - it went to the visitors.There seemed to be little danger for the Queens defence when the ball was played into the area, but under pressure and with his back to goal, Mikkelsen was somehow able to hook the ball over Leighfield and into the net via the crossbar. The goal certainly affected Queens, and it was the visitors who began to dominate proceedings with Flood and young Matthew Smith begining to have more possession. 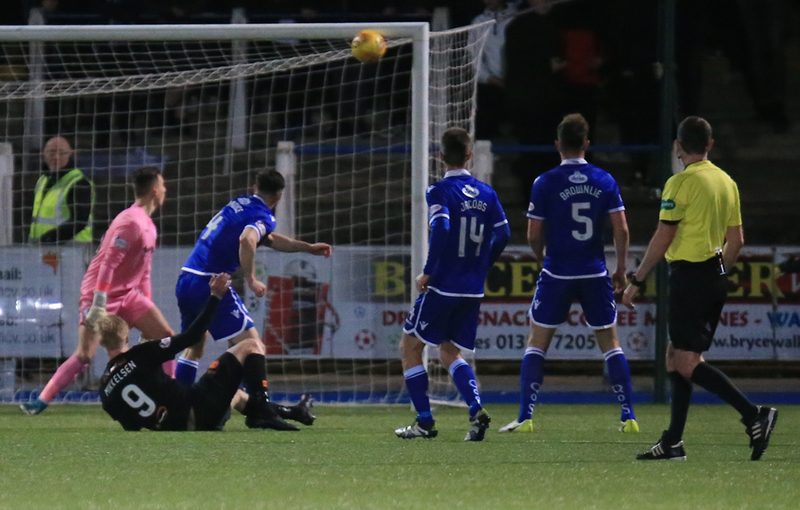 Queens went close when a low shot from Rankin was pushed away for a corner and following the set-piece Dobbie shot straight at the `keeper. Unfortunately for Dobbie, and Queens that was to be his last involvement in the game as following an earlier tackle on him by Flood, Queens` top scorer never fully recovered and was replaced by Ross Fergusson. In a game that produced one or two very physical challenges, Lyndon Dykes was booked for what looked like just a normal challenge. 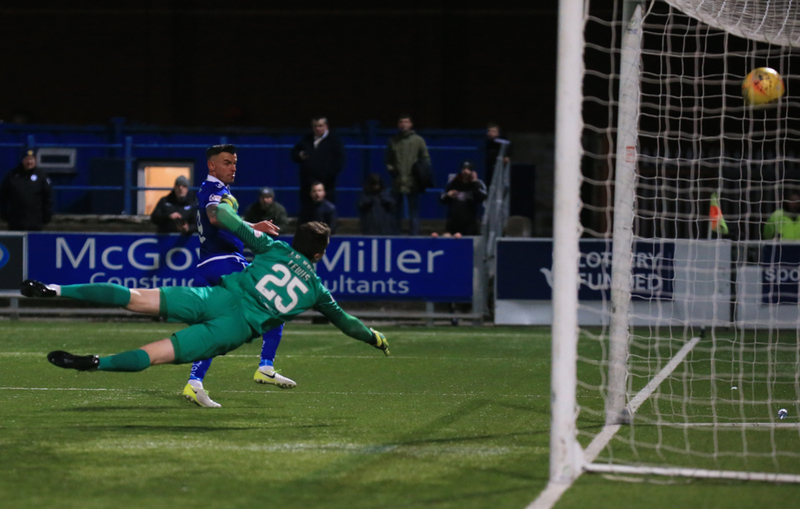 Dom Thomas continued to look the most lively for Queens and he went for goal from an almost identical position to where he had scored from, this time though there was not enough curl on his shot and it went well wide of the target. 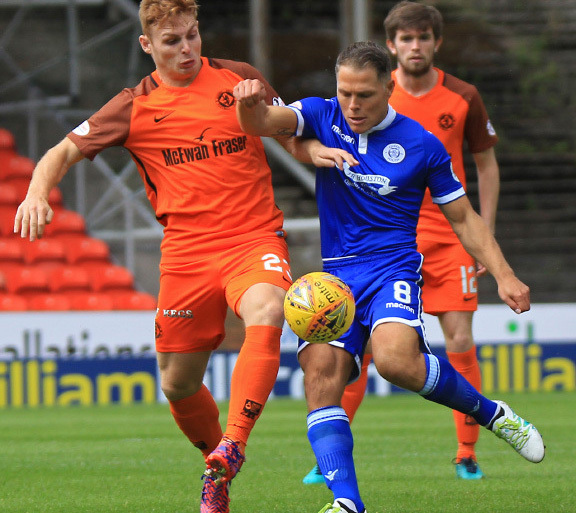 Play was held up when Fergusson, and former Queens man Mark Durnan collided in midfield, and although Fergusson returned straight away, Durnan missed the last 5 minutes of the half to have his wound seen to. With the last move of the half, United won their first corner of the game, but Queens were able to defend the set-piece well, and the half ended all square. The second half was just three minutes old when the game turned in favour of the visiting team. Collecting the ball just outside the Queens penalty area, Smith unleashed a powerful drive that flew past Leighfield and into the top corner, and from that moment, Queens began to struggle. The confidence was clearly knocked, mistakes were being frequently made, and the away side looked more likely to score again, and score again they did after 57 minutes when King`s corner found it`s way to Smith who stabbed the ball home from close range. United - who had not played since February 23 - looked much sharper and stronger, and could have added a fourth goal when Flood raced through, but Leighfield was alert enough to race out from goal and just clear the ball to safety. Queens went to the bench just past the hour when Rankin and Dykes were replaced by Lyle, and Murray. 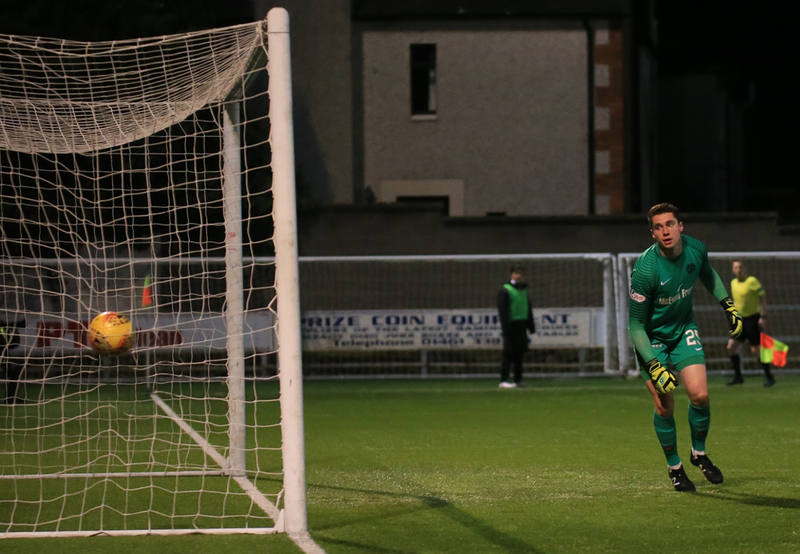 A close offside call prevented King from adding to the scoreline, and at the other end the offside flag was raised to prevent Queens from pulling a goal back when Connor Murray`s well struck shot was pushed out into the path of Derek Lyle, but the veteran striker was adjudged to have been offside - correct, but very close. Minutes later the same player had another effort disallowed, this time it was very close and Lyle was more than convinced that he had stayed onside. The visitors thought that they were going to be awarded a spot-kick on 81 minutes when substitute Scott McDonald went down in the box, but referee Muir decided that the United man had dived and he was booked for simulation. United really should have added a fourth goal a minute from time, but Smith, seeking a hat-trick paused before shooting when well placed, and that delay allowed Leighfield to pull off a smart save to deny him. Queens threw caution to the wind for the closing stages pushing Darren Brownlie upfront, but they never really tested the visitors defence and a game that started so well ended with Queens sadly being well beaten. Other results went against us as well and after starting the night with a chance to climb into 4th place, unfortunately we have now slipped down two places after yet another disappointing Palmerston result.